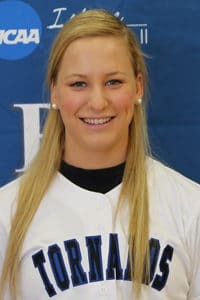 The highlights of Jamie Hrobak’s softball career at Brevard College run so long that sports information director Randall Stewart can’t detail all of her school records on a single page. Of course, when you set 58 new marks for the program, the need for extra space is no surprise. But what Stewart and others at Brevard will also point out as equally impressive is what Hrobak did when she wasn’t on the field amassing that list of achievements. Dean’s List every semester. Two years as the softball team’s representative on Brevard’s Student-Athlete Advisory Committee. Resident assistant in the school dorms for three years. Chosen as one of two student speakers at Brevard’s recent commencement. From the time she crossed the stage at Polk County High until her recent trip in cap and gown, Hrobak built a legacy that will undoubtedly live on for some time at Brevard. And found out a few things about herself along the way. * First in school history in wins (47), saves (3), appearances (148), starts (103), complete games (64) and innings pitched (718). * Single-season records for starts (41), innings (258.1), and strikeouts (276). * Single-game records for strikeouts (17), strikeouts looking (6) and being hit by a pitch (2), her lone hitting record. * All-South Atlantic Conference second-team selection in 2016, honorable mention in 2014 and 2015, four-time SAC pitcher of the week. Hrobak faced 3,192 batters in her four seasons. That’s a lot of pitches. Ask Hrobak about her most memorable game at Brevard, and she won’t point to the one-hitter she threw against Erskine for her first career win nor the one-hitter she tossed in her final career win, a 3-0 victory at Converse. No mention of the 17-strikeout game against Johnson C. Smith or a 15-strikeout effort last season at Montreat. None of those top her list. A bit modest? Perhaps. But that’s just one of the lessons Hrobak learned at Brevard, and one of the things she’ll look to pass along in the next phase of her life. She also loved what Brevard College did the past four years in helping her reach her dreams, as she told those gathered for the college’s graduation ceremonies. As she looks to establish herself in the classroom, the natural question for Hrobak is whether she’ll also look to share the wisdom of her softball background. Hrobak admits she hopes to do that as well – one day. Hrobak has already shown promise in the classroom, earning statewide recognition as a student teacher at Flat Rock Middle School. Now, with degree in hand, she hopes to build on that success just as she built a legacy on the softball field. “I’m excited to take my new mindset and my new persona into the next phase of my left,” Hrobak said. No doubt a long list of accomplishments will soon follow.